I went the next day and found the domaine at the top of the village directly in front of Salon. We tasted through a bunch of champagnes and proprietor Philippe Charlemagne entered near the end of the apero. When I asked him about possibly importing his wines to the states, he told me he was already being distributed in most of the states through a broker. The prospect of importing these excellent champagnes was a no-go. Flash forward another couple of years and I found myself at the Charlemagne abode once again. 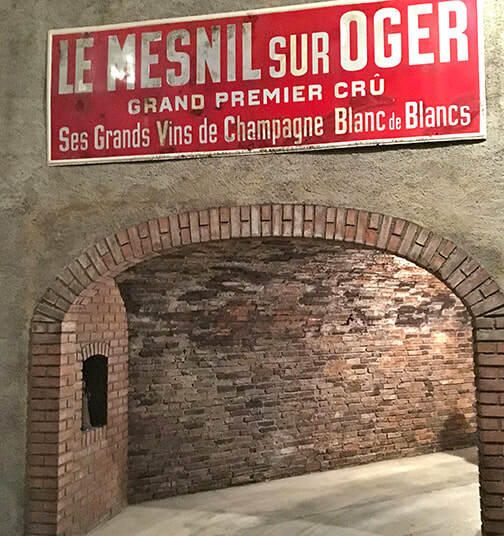 I sat with Philippe at a table and he opened a bottle of Mesnilisime 2004, his vintage bottling fer­mented in barrel, without malo, and solely from his Mesnil vine­yards. This time he told me that his California distribution had come to a standstill and he was interested in working with me. It took us about 30 minutes to finish the bottle while we spoke about neighboring producers, politics and food. A friendly agreement via a handshake followed. 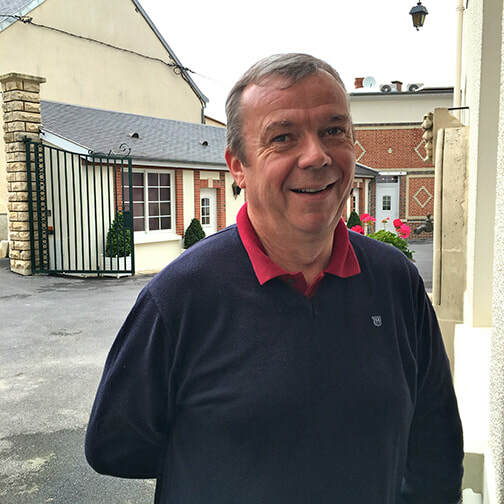 Philippe, a mile a minute talker, is the fifth generation descendant of father to son winegrowers in Le Mesnil since 1892. With RM sta­tus, he only harvests and vinifies grapes grown on his 15 hectares (37 acres) of vines. The majority of his vines are in the Cote des Blancs, more specifically Oger and Le Mesnil along with some plots in Cuis. But Charlemagne also has vines in Mancy, Glannes and in the Sezannais that he uses for specific cuvées. 87% of his vines produce Chardonnay, with the remaining 13% produce Pinot Noir. About 130,000 bottles of champagne are produced a year, with 70% being exported abroad. Harvest is carried out entirely by hand and usually takes place in September. Freshly cut, the grapes are delicately pressed in one of their two traditional presses, each contain­ing 4,000 kilograms of grapes. 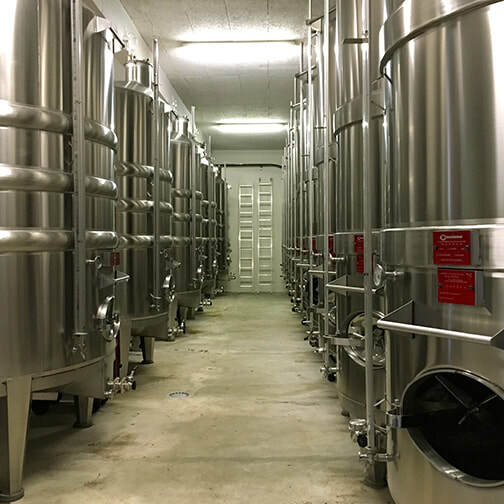 Slow fermentation in temperature-controlled stainless steel vats slowly transform the grapes into wine. After 100% malolactic fermentation, the wine is blended by marrying wines with different aro­matic qualities. The bottles age quietly in dark chalk cellars beneath the winery where the secondary fermentation takes place. 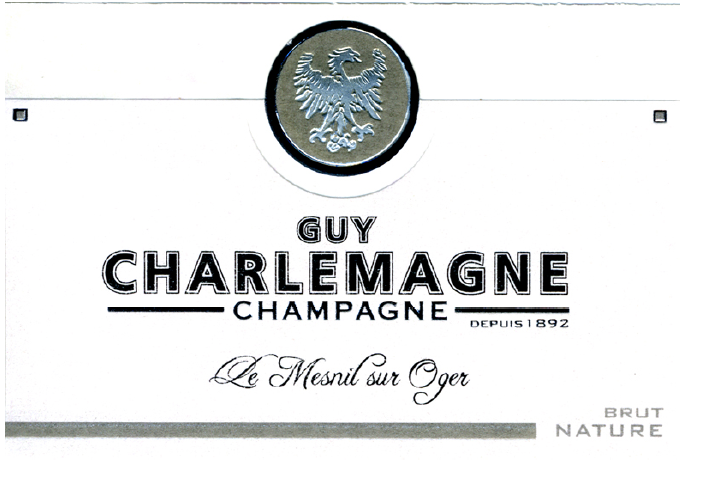 After riddling and disgorging, the bottles are prepared and labeled with an eagle, the Charlemagne emblem. Mesnilisime Grand Cru comes from vines that have an east/southeast exposure and are planted on limestone soil, ensuring a slow but constant water supply that infuses the Chardonnay with finesse, elegance and min­erality. Only the best single vineyards are selected for these cuvées (including Chétillon, Coullemets, Vaucherots, Mont-Joly and Aillerand du Midi). 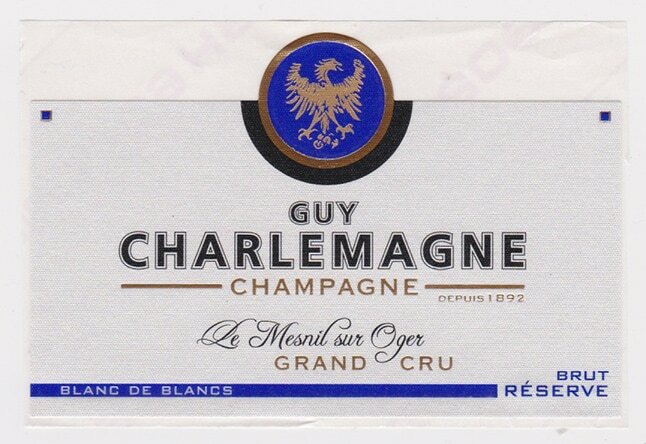 The average age of the vines is 42 years-old, and the mosaic of small parcels allows Charlemagne to accentuate the champagne’s expressive characteristics and personality. Ratafia is a term used in France and abroad for sweet, fortified beverages made with a fruit base. Part of the group known as mistelles or Vin de Liqueur in France, Ratafia falls into the same category as Pineau des Charentes, Floc de Gascogne, Pommeau de Normandie or Macvin de Jura. In 2015, Ratafia de Champagne was awarded a Protected Geographical Indication (PGI) by the INAO. 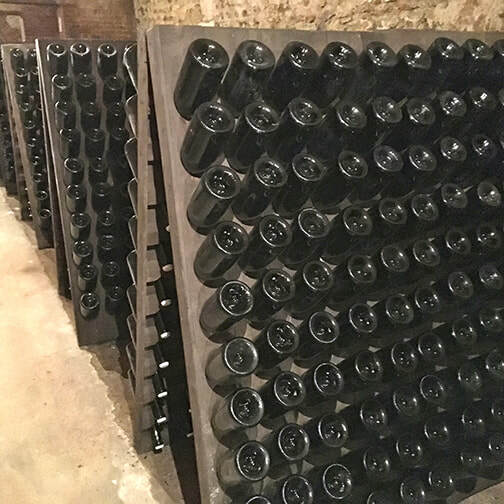 For bottled champagne, only the free run juice and first two pressings of the grapes are allowed (just over 80% of the grape’s potential juice). Third and fourth pressings, that often contain bitter or astringent elements, are set aside for the base matter of ratafia de champagne. This rich juice, usually made with a blend of the three major champagne grapes (pinot noir, chardonnay and pinot meunier), is placed in a vat and chilled, allowing the heavy solids to settle. After a racking, the unfermented juice is fortified with the addition of about 30% clear marc de champagne or fine de champagne at 60% alcohol, purchased from a local distillery. The addition of alcohol overwhelms the yeasts and prevents the fruit juice from fermenting, leaving a stable sweet blend of around 18% alcohol. This mixture is then placed in large oak casks where it is often mixed with other vintages with a solera-type aging. It is normally served as an aperitif, but can also be consumed with desserts or with foie gras and strong, soft rind cheeses. 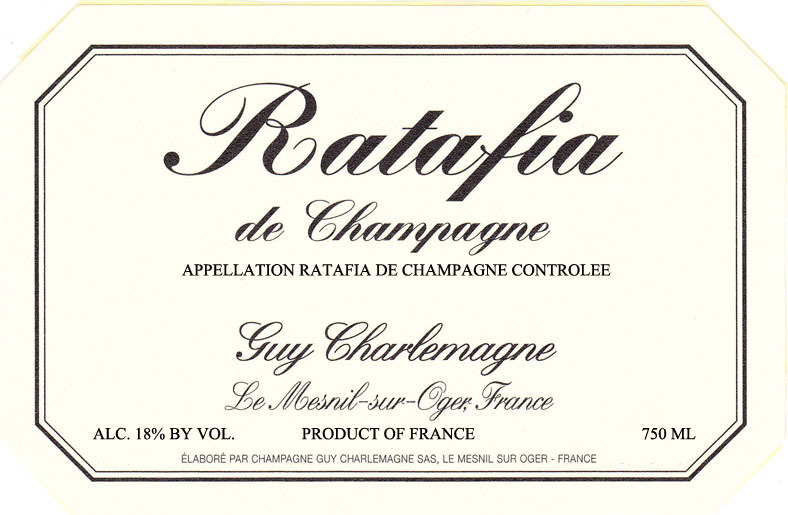 The Guy Charlemagne Ratafia de Champagne is aged in oak casks for 4 years. It has a lovely amber color that emits aromas of cherry, almond, chocolate and fine herbs. On the palate, more dried fruits emerge on its creamy texture, including apricot, grapes and spices. We enjoy this with strong cheeses like Munster, Epoisses and Maroilles, accompanied by walnuts. Brut Nature: Made with grapes from the Sezannais (about 40 minutes southwest of Mesnil) using a blend of 70% Chardonnay and 30% Pi­not Noir, vinified in thermo-regulated stainless-steel with 100% malolactic fermentation. Rests en tirage for 36 months. The current vintage is mostly the 2010 (60%) along with 2009 (20%) and vins de reserve (20%). The bot­tling is completed without any dosage. Clean and fresh, this champagne reveals the Sezanne terroir. It has a straw yellow color, with white flowers on the nose and light, intense and forward fruit aro­mas (grapefruit, lemon peel) along with a touch of honey brittle. The palate has plenty of elegance and minerality. The finish is bone-dry. 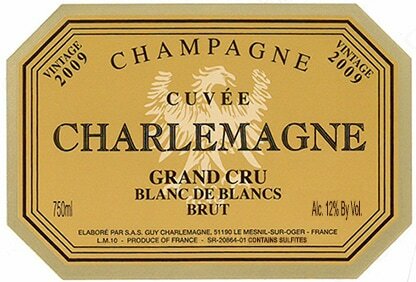 The Wine Spectator: “Pale yellow color, steady stream of fine bubbles. Very citrusy nose, where acacia and rose water aromas mesh with a creamy texture with exceptional length; the citrus notes (lime and pink grapefruit) give the champagne freshness before melting into notes of fresh hazelnuts, yeasty bri­oche a minerally sublayer of smoke, stone and spice. This wine will be appreciated both during the aperitif or with an appetizer of warm oysters. 92 points. afford­able price need look no further.” The Wine Spectator : “Fresh and focused, with a cor­nucopia of flavors—ripe fruit (mango, tangy quince and tangerine) are joined by a min­erally sublayer of smoke, stone and spice. This shows firm structure and intensity, but the overall juiciness of the acidity makes this very appealing right now. 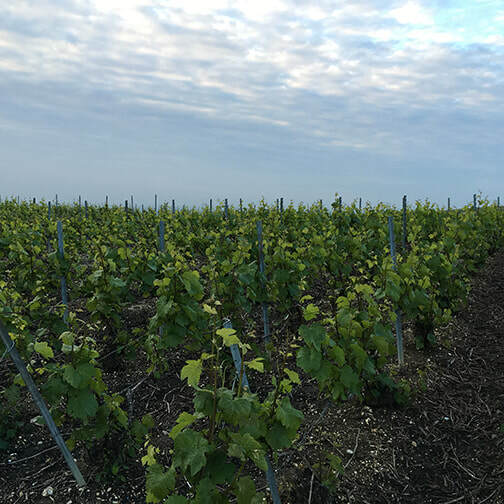 2010 Vintage Grand Cru: This cuvée comes from the Côte des Blancs vil­lages of Le Mesnil-sur-Oger and Oger and is only made in exceptional vintages. Harvested from some of the property’s top plots, this pure Chardonnay is vinified in thermo-regulated stainless-steel. The wines go through 100% malolactic fermentation. Matured 4 years in underground chalk cellars, this vintage shows extreme finesse and is bottled with a 6 gram dosage. From its straw yellow color come fine and steady bubbles. It exhibits a complex nose where dried fruit (raisins and figs) mixed with candied fruit (oranges, pineapple) lead into a finish that is not only long but also remi­niscent of slightly spicy blond tobacco.